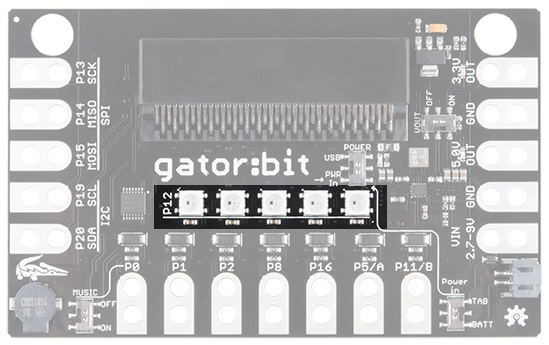 Note: This tutorial is for the SparkFun gator:bit v1. If you are using any of the newer model (v2) with the barrel jack instead of JST connector, please refer to the new tutorial. 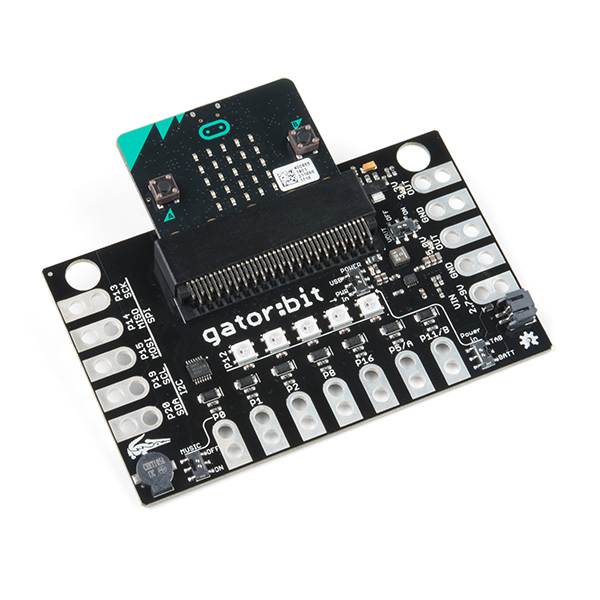 Gator:bit is a development board for BBC micro:bit. Almost every pin on the micro:bit is broken out to alligator clippable pads so you can get the most out of it. 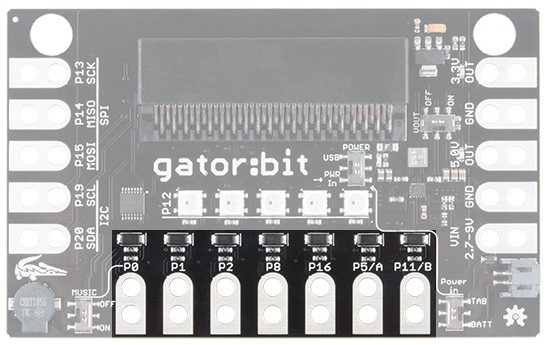 Gator:bit comes equipped with five addressable LEDs, a built-in buzzer (speaker) as well as a power management system that gives you access to 3.3V and 5V. 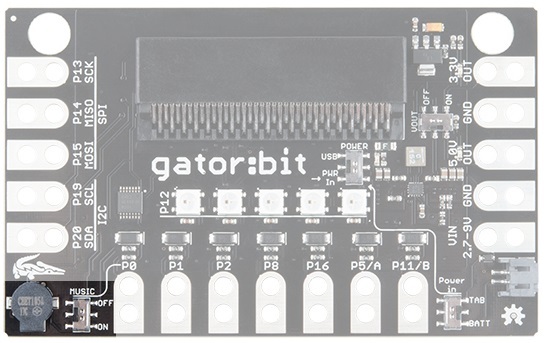 Gator:bit can be powered from 2.7V - 9V giving you quite a range of powering options. 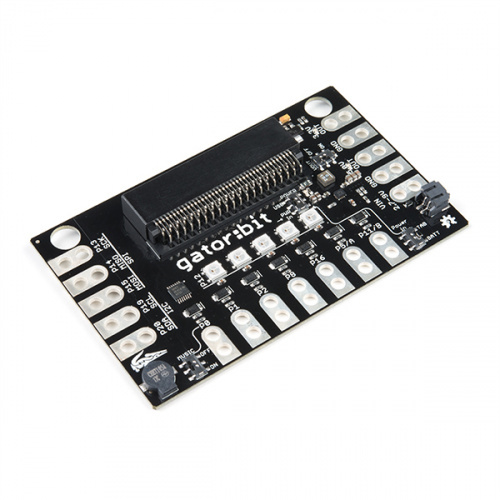 Without any external hardware Gator:bit is still an exploratory development board for micro:bit. Whether it is data visualization using the on board addressable LEDs, capacitive touch sensing on pins 0, 1, & 2, or creating musical works of art using the built-in speaker we've got it covered with the with the Gator:bit. There are 2 ways of powering your gator:bit, either from the JST battery terminal or the alligator clippable pads labeled "VIN". Any voltage input between 2.7V and 9V will be regulated to 3.3V to power the micro:bit, the speaker, and for use by any of the alligator clippable pins. 5V is also regulated from the input to power the LEDs and any off-board hardware you would like to use like servo motors. However you choose to power your boards, you must select your powering option on the switch labeled Power In on the bottom right side of the board. Choose BATT if you are using the JST terminal or select TAB if if you are using the alligator tabs with another power source. You will notice an arrow that runs from Power In to the master POWER switch near the card edge connector. If you are providing power from either the JST connector or from a clipped source that master switch should be placed down at PWR IN. If you are not using the JST terminal or alligator clips to provide power, the gator:bit can be used with a USB on the micro:bit. If you leave the master switch set to PWR IN while using a USB cable, you will be powering the gator:bit from the micro:bit's 3.3V output. You will have full use of gator:bit with the exception of the use of the 3.3V/5V power out. 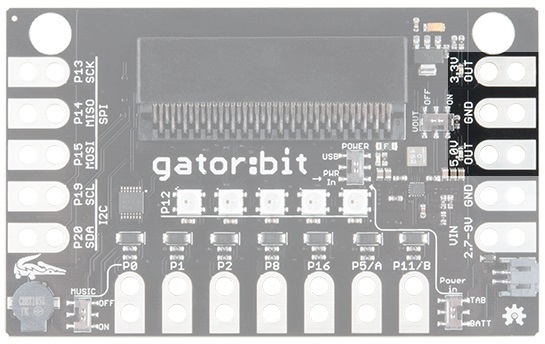 If the master switch is up to USB, the voltage coming in from the micro:bit will go through the voltage regulators and give you full access to the gator:bit and any peripherals. Note: It is not recommended to power the gator:bit from USB - the voltage regulators will emit a high pitched noise. Regulating the voltages coming from the micro:bit is not an ideal situation but does come in handy when you need to quickly test a new project. 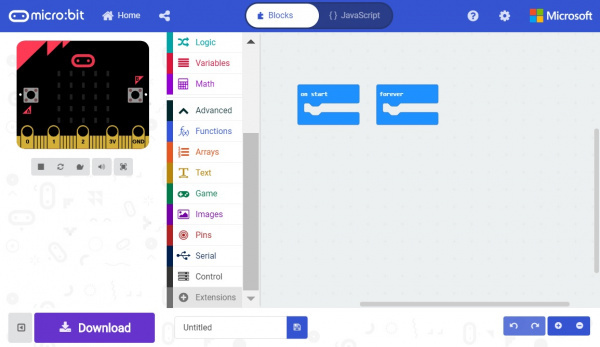 The point of gator:bit is to give you access to as much GPIO as possible from the micro:bit, safely. Not only are pins 0, 1, 2, 8, 16, 5 (Button A), and 11 (Button B) broken out, but they are also protected against overvoltage and overcurrent/short circuit. Pins 0, 1, & 2 are ADC pins and are also the capacitive touch pins. Pins 8, 16, 5, and 11 are digital pins capable of read and write. 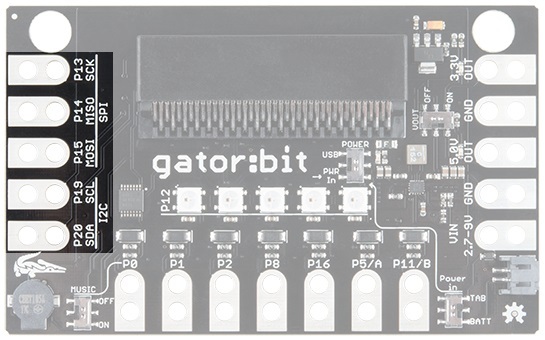 The gator:bit gives you access to more micro:bit pins and it also gives you access to 3.3V and 5V. Your servo action is about to get a little cleaner and you'll be able to easily power peripheral hardware. You'll notice another switch here. The speaker is attached to pin 0, so if you want to play music the music switch needs to be on and you won't be able to use pin 0. Conversely, if you want to use pin 0 th music switch needs to be switched off. Did we mention those mounting holes on the gator:bit were made to be compatible with with the single LEGO piece? From one baseplate we've built a rack for the gator:bit, a battery enclosure, and along the bottom an alligator clip cable management system. 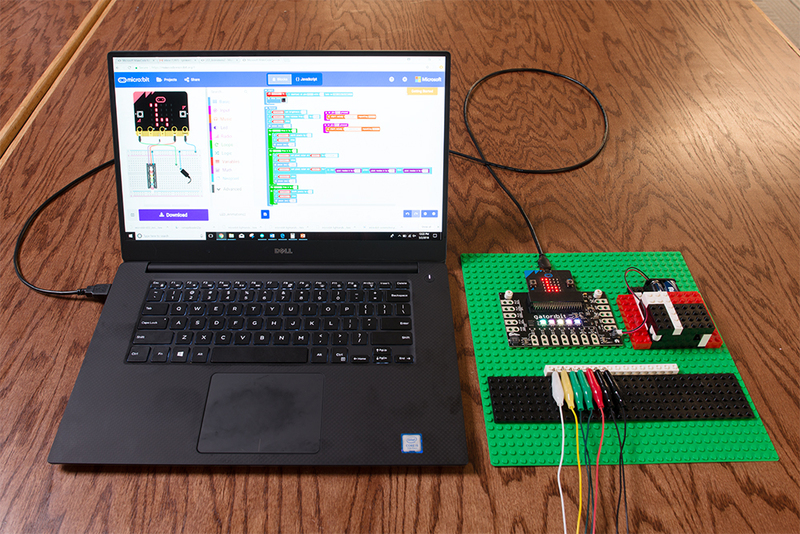 When you are done learning all about microcontrollers, radio and bluetooth communication, and data collection and visualization, you can hang your baseplate up and keep everything organized. Heads up! Previously, these libraries were referred to as MakeCode packages. They are now referred to as MakeCode extensions. 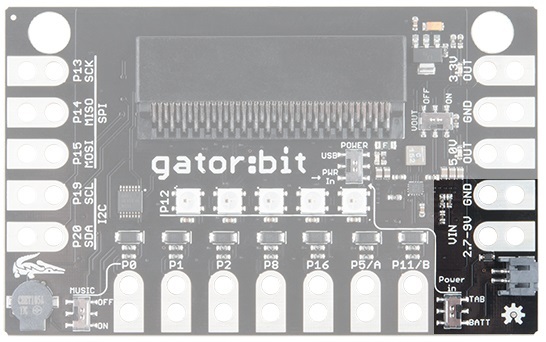 gator:bit Schematic (PDF) - Schematic for the gator:bit. 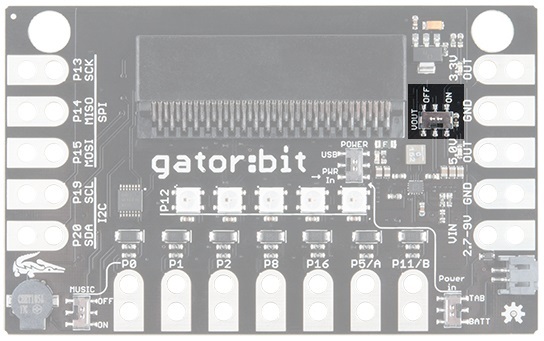 gator:bit Eagle Files (ZIP) - Board design files for the gator:bit.